I'll admit, it's hard not to have a rooting interest up-front in this matchup. Gerry Thompson of MetaGame Gurus Sun has worked at Wizards of the Coast, he was one of the first people to show me around when I moved to Seattle, and I've even known him as far back as my days in Iowa (read: a long time). Plus, his deck is hard to root against. Let's spend a moment on Thompson deck. 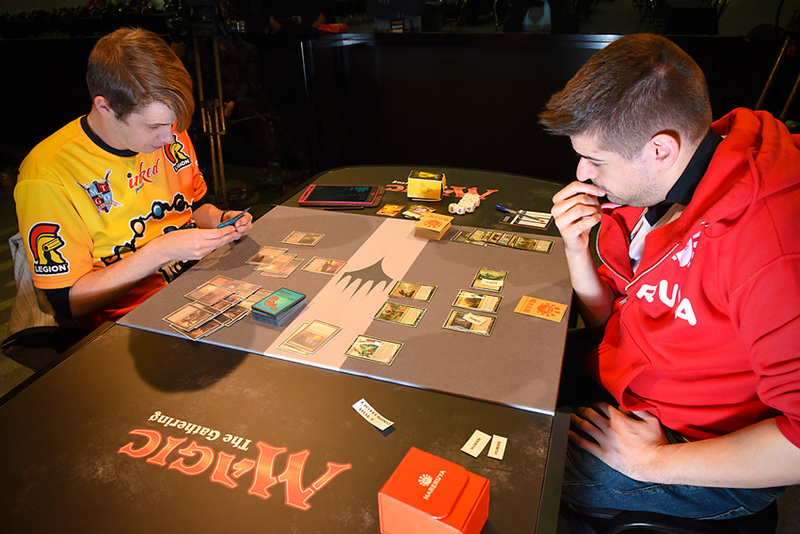 By his own admission, he didn't have much experience with the Mardu Deck that took him to the Top 8, but he's played it masterfully. With just a 3-3 record in Draft, he needed to succeed in Modern. At 9-0-1, Thompson had the best record of any player in the tournament in Modern, and the only thing stopping him from going 10-0 was the draw in his final round to lock up the Top 8. The deck utilizes all kinds of unsung Modern heroes. Young Pyromancer has been overlooked for some time, but now there are eight copies in the Top 8. Bedlam Reveler has seen very little play, but is often a two to three mana Ancestral Recall plus prowess attacker in Gerry's list. Blood Moon is the ultimate spoiler. Finally, Collective Brutality might just quietly be the card of this tournament. 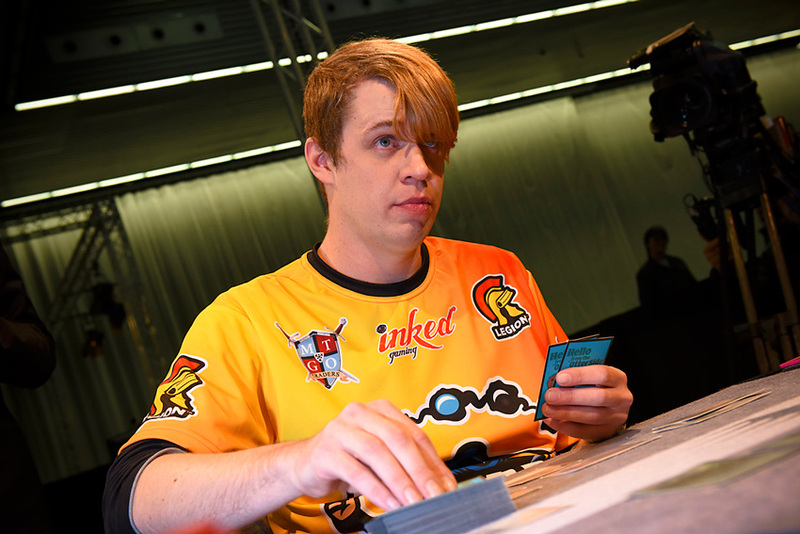 But the deck of this tournament has clearly been 5-Color Humans, which is the weapon that No. 19 ranked, Connected Company team member, and all-time Spanish Pro Point leader Javier Dominguez is wielding in this Top 8. I'll admit, I find it hard not to root for Dominguez as well. He's a good guy with an oh-so-close-but-so-far second place finish at the World Championship this past year, and he's playing honest-to-goodness Magic by attacking with a bunch of 1/2s, 2/2s, and 3/3s. Granted, they rarely stay that size for long. Thalia's Lieutenant is capable of growing his army of disruptive beaters ever larger—certainly larger than the 1/1 tokens Thompson's deck is replete with—and Champion of the Parish plus Kessig Malcontents are capable of churning out buckets of damage in one swing or swoop. Whoever you root for, it's hard to go wrong in this one. Prior to the match, Thompson said he'd always been a fan of Dominguez, and Dominguez recalled a time when Thompson was friendly toward him before he hit the big time. Basically, it was the friendliest pre-game conversation not involving Reid Duke I've ever heard. With Javier Dominguez and Gerry Thompson being well known as friendly faces on the Pro Tour, it was hard to pick one to cheer for. So uh…can we cheer for both of them? With two players like this, let's face it. We all win. Dominguez, on the play, (not-so) shockingly led off with a one-drop Human—in this case Noble Hierarch. Thompson started on an Inquisition of Kozilek, spying a hand full of Humans, obviously. Kitesail Freebooter and Meddling Mage were the two most pressing targets, and the Freebooter hit the bin. Then came the Meddling Mage. Dominguez tried to get the soul read on Thompson, gazing dreamily into his eyes while Thompson tried to give nothing away. "Lightning Bolt," Dominguez said as Gerry stared at a very much Lightning Bolt-less hand. Terminate, instead, loomed large. A second Meddling Mage followed, prompting the response of Terminate. Dominguez hadn't read his soul on the second turn, but Thompson wasn't taking any chances that his two-land pass had given him away. Dominguez re-upped his call on Lightning Bolt. Thompson, however, was more interested in looting faithlessly (read: casting Faithless Looting) and taking out the second Mage with Collective Brutality. So then Dominguez cast a third. Lightning Bolt was still the call. Meanwhile, Dominguez was packing away at Thompson's life total with a pair of Noble Hierarchs, even as Thompson kept pecking away at Dominguez's threats. Thompson fell to 13 by the time Dominguez had played out his entire (non-land) hand. So here we were, Meddling Mage and Reflector Mage and a pair of Noble Hierarchs versus Thompson's empty board but stacked hand. He filtered his way through a few more cards, cast Collective Brutality on the Meddling Mage, and took a 4-damage hit from Reflector Mage. Fatal Push eliminated a Noble Hierarch, clearing the way for Thompson to land Bedlam Reveler followed by a Young Pyromancer. The board was Thompson's for the moment. Dominguez remains one of the most animated players on the Pro Tour, agonizing over every possible play and decision in his games. "I never had a Lightning Bolt," Thompson whispered, like a man who had gotten away with something. "I know," Dominguez said, through what looked like a bit of a grimace. Still, Mantis Rider gave Dominguez a path to victory. Thompson fell to 4 life, then dispatched the flier the following turn. Bedlam Reveler began chipping away in 3- and 4-point chunks of life while Young Pyromancer provided a seemingly endless string of chump blockers. Thompson was dancing on a fine line with life totals at 12-4, as he had done all weekend, but he was maneuvering that lane expertly. Or whatever mixed metaphor you want to insert here. A fourth Meddling Mage naming Faithless Looting actually stopped Thompson in his tracks. His life total was too low to take any risky lines, and his engine stopped humming without the red draw spell. Lingering Souls let him shore up his defenses, but it was immediately met by a Mantis Rider. Life totals were 7-4, and it was just getting interesting. The Mantis Rider traded with the Spirits, and Dominguez played a weak but flying Kitesail Freebooter. Well, weak until it was joined by Mantis Rider for exactly 4 damage. "That was lucky," Dominguez said, more smile than grimace this time. "I know you know," Thompson replied, more grimace than joyful whisper this time. Dominguez hand was a bit iffy to start the second game, and became just that much worse when Thompson cast Inquisition of Kozilek on his first turn and followed with a second-turn Young Pyromancer. Dominguez saw the powerful two-drop, groaned, and passed with no turn two play. A second Inquisition revealed a Mantis Rider, which was discarded, and a Reflector Mage, which bounced the Young Pyromancer. That bounce allowed Thompson to turn on revolt, letting Fatal Push remove the offending three-mana bounce creature before casting a pair of Young Pyromancers. By this time, Dominguez was flooded. He had three lands in play, three in hand, and an Æther Vial on three counters. He found a Champion of the Parish, but it looked especially anemic with no friends. Two of Dominguez' lands were Horizon Canopies, so he wasn't completely out of it, but it was going to be an uphill climb from this point. His draws did yield some pretty powerful tools for climbing that hill. Thalia's Lieutenant pumped his team, and Phantasmal Image copying Bedlam Reveler drew him three cards. It was powerful enough to turn a game that looked to be a blowout into what more or less looked like a stalemate at this juncture. Then it was Thompson's turn to hit back. Thoughtseize gained him two more tokens and stripped a Meddling Mage. Liliana of the Veil started attacking hands, and Bedlam Reveler even got to attack. Thompson often remained cool and composed and his matches, only to occasionally break said composure with the occasional smile or laughter. The back-and-forth game went back again. Dominguez felt free to attack with three creatures, which Thompson simply chump-blocked with Elementals. Thompson replaced them the following turn with a Kolaghan's Command, then drew three more with a second Bedlam Reveler. That, naturally, led to Dominguez drawing Phantasmal Image to draw three more cards himself. He chained that into another Bedlam Reveler and just kept on drawing cards. "Maybe I should put Image in my deck," Thompson mused. Still, even six cards in a turn weren't enough. Thompson had Dominguez low enough from earlier attacks (7) that a pair of Lightning Bolts and a slight advantage on the board were enough to kill Dominguez from there. Thompson once again started on Inquisition of Kozilek, but this time, Dominguez's hand was juiced. Thalia, Kitesail Freebooter, and Sin Collector were all possibilities for Thompson, and he eventually landed on the legend. 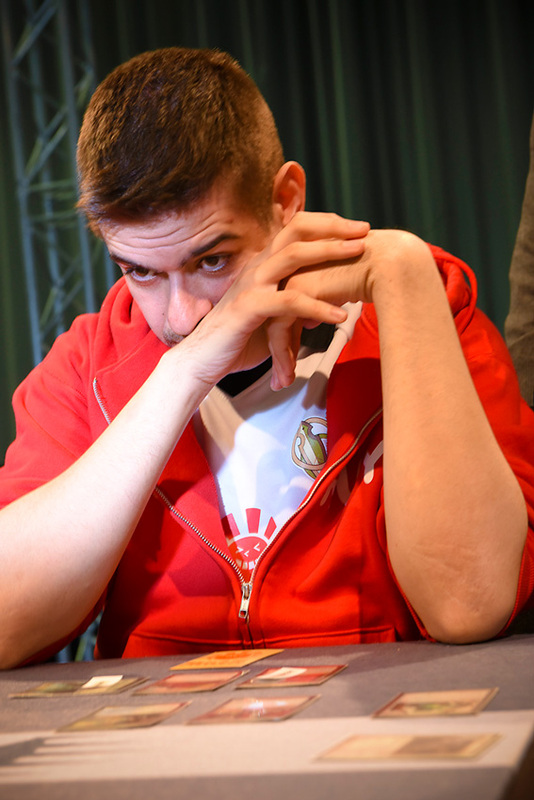 But with an Æther Vial already in play and a hand full of options, Dominguez was primed and ready to go. Or, he was, until Thoughtseize stripped another option from his grip. Sin Collector completely missed the following turn, revealing Thompson's grip of two Bedlam Reveler and a Young Pyromancer. The Kitesail Freebooter missed as well, leaving Dominguez with no hand and merely a 1/2 and a 2/1 to show for it. Ok, so his hand had looked powerful at least. Instead, it now looked pretty anemic as Thompson reloaded with Bedlam Reveler before declining to attack his Young Pyromancer into a pair of Æther Vials. "I'm a coward," Thompson said through a knowing smile. But that Pyromancer was far too integral to Thompson's plan, as a pair of Lingering Souls combined with the Pyromancer to positively flood Thompson's board with creatures. Thompson looked to be pretty far ahead. Kambal, Consul of Allocation slowed down Thompson's spell-based attack a bit, but not enough to take him off it. Instead, he continued to flash back value spells and continued to add tokens to his board. Besides, Terminate took care of the Kaladesh legend regardless. The board was busy at this point. Dominguez was at a healthy 15 life while Thompson was at a more precarious 6. Tokens and humans littered the board, and even Bedlam Reveler was matched on each side. The battlefield was a mess. And it was into that mess Thompson waded, sending his tokens into Dominguez' cadre of X/1s, cleaning up the battlefield some while getting 3 damage in. It was something. But it was not something that could handle Izzet Staticaster. The pinger cleared Thompson out of Spirits, letting Dominguez crash in with a double-exalted Kitesail Freebooter, dropping Thompson to lethal range next turn. From the top of his deck, Thompson found some help. Kolaghan's Command let him eliminate the flying threat while bringing back a Bedlam Reveler and finding three fresh cards. It was enough to stay alive, but whether it was enough to win was a far more pertinent question. It was, at least for the moment, enough to hold Dominguez back from attacking. Another Bedlam Reveler gave Thompson another look at three cards and some more tokens, but didn't let him break through. "I want to attack you so baaaad," Thompson intoned. Yet he didn't. "I want to attack you too," Dominguez also offered. Yet he didn't. Next turn, apparently, Thompson did want to attack—because he did. He sent in five Elemental tokens who were likely turning into Staticaster food soon anyway. Then Dominguez made a fateful block—putting his Izzet Staticaster in front of a token. Thompson had successfully baited Dominguez into putting the Staticaster in harm's way. It was the kind of play that gets people up from their seats at a Friday Night Magic, pumped about what they just pulled off. It was game defining and, possibly, tournament defining. Rather than riding his Staticaster to victory, Dominguez was now trying to gut out a win with a Kitesail Freebooter. It didn't work. Thompson held serve long enough to end the game with, fittingly, another copy of Collective Brutality. Another game—this time the fourth—and another Inquisition of Kozilek. As you do. Then he followed with a Young Pyromancer. Also as you do. Dominguez, for his part, led Noble Hierarch into Thalia into Kitesail Freebooter, a strong start, then shook his head and grumbled when he saw Thompson's stacked hand of Lightning Bolt, Collective Brutality, Terminate, Lingering Souls. Basically everything. And when paired with a Young Pyromancer? Dominguez had reason to grimace. Thompson got to work cleaning up the board. Collective Brutality eliminated the Freebooter, Bolt took out Thalia, and Faithless Looting gave Thompson options. "This is looking extremely bad," Dominguez said, this time through a smile. What else could you do but smile in the face of so much removal? The answer, as it turned out, was not much. Thompson made sure not to play a Bedlam Reveler that could be copied by one of Dominguez' Phantasmal Images, and just made token after token after token before the final points were dealt by, appropriately, Collective Brutality. Gerry Thompson defeats Javier Dominguez 3-1 and advances to the semifinals!